What are England’s odds of winning Euro 2012? For all the latest win probabilities for Euro 2012, check out our interactive bracket. Here are 3 thoughts about today’s fixtures in Group D.
1. What analytics say about England. England played well enough to salvage a 1-1 tie with France in the 86 degree heat in Ukraine. The results didn’t change England’s probability of winning Euro 2012. It’s 5.4%, about the same chance that the scientific study that guides your medical treament is wrong. 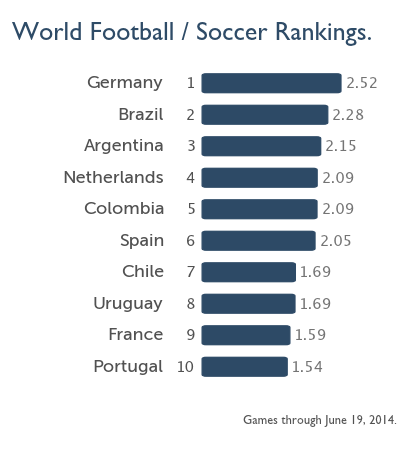 From our analysis, England excels on offensive, with a ranking of 10th in the world. Against an average defense, they would score 1.9 goals on average. From the game today, England might need suspended star Wayne Rooney to reach this type of excellence. On defense, England is ranked 30th and predicted to concede 0.85 goals to the average team. 2. France is still an enigma. The French are a cross between the 2012 New York Knicks, who are talented underachievers, and a 16 year old girl, who just wants to look pretty. With stars like Frank Ribery, Simon Nasri and Karim Benzema, this team should be scoring hordes of goals. Instead, they show up as the 46th best offensive team in our rankings. They play beautiful one touch football. It only seems natural that this skill would translate into lots of goals. Maybe it will happen in Euro 2012 and prove our rankings way off. I didn’t see much of Ukraine and Sweden match. But in the 10 minutes I did see before halftime, the home crowd energized the Ukraine team. It was a stark contrast to the French, who couldn’t be bothered to pressure England’s goalkeeper in the 90th minute. 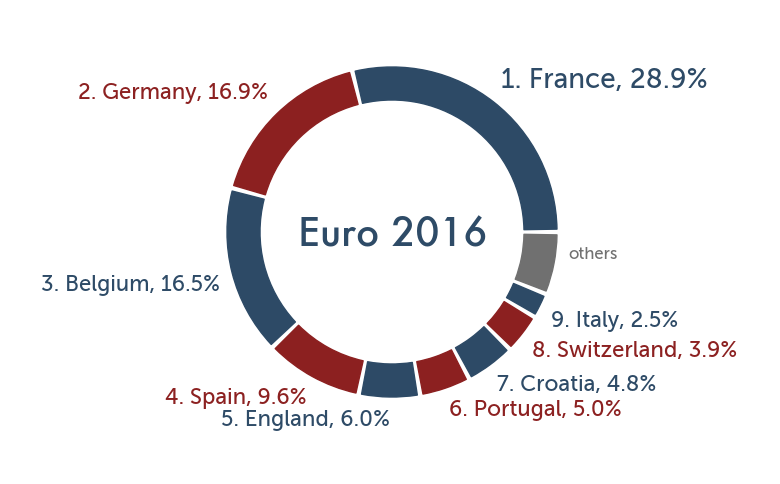 In Euro 2012 qualifying, the home team won by 0.41 goals on average. With this edge, the Ukraine actually had a higher win probability, 39.5%, than the more highly ranked Sweden team, 33.9%. With their 2-1 win today, Ukraine’s odds to win Euro 2012 rose from 4.5% to 6.5%. In a scheduling quirk, they could play up to 3 knock out games on home soil if they finish second in the group, but only 2 games if they win. Am I not giving England enough credit for their play today? Please leave a comment.